Adilabad District Minority Residential Schools under TMREIS: The Telangana State government has sanctioned Seven(7) new minority English medium schools to Adilabad district. Considering the need to uplift minority students in social, educational and economic development sectors, the government sanctioned 7 residential schools to the district. 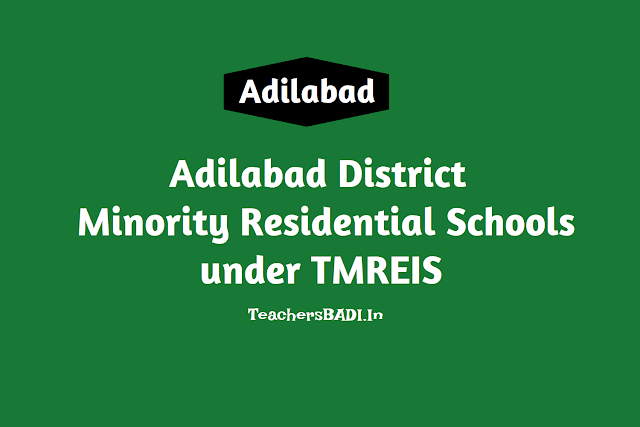 The TMR Schools provide high quality and free education to the children of most economically backward minorities communities of the Adilabad district, to enable them to avail professional educational courses and jobs in the government and public and private sectors but also to have access to the best opportunities in education at par with other communities. The Schools provide a dynamic educational environment that helps children face the demands and challenges of a competitive world. Comprehensive physical, mental and socially relevant development of all students enrolled in each and every residential school, in their homes, in their village and finally in a larger context. Focus differentially on the educational support to be made available to those standards XI and XII and those in standards VI to X, so that their distinctive needs can be met. Support the annual expenses in a manner that offers reasonable remuneration to the staff and up keep of the facilities. Support the construction of infrastructure that provides education, physical, environmental and cultural needs of student life. These schools would have English as first language and Urdu as second language. Among the sanctioned schools, it would constitute five schools for boys and three schools for girls in the district which would be established in seven constituencies of Adilabad, Nirmal, Mudole, Sirpur, Manchirial, Khanapur. Accordingly, Executive director of Telangana State Minority Finance Corporation the building locations were already finalised and the principals and Urdu academy faculty were made in-charges for all these schools. All these residential schools would be made operational from the academic year 2016-17 beginning from June. “This academic year we are planning to start three academic classes for fifth, sixth and seventh classes in English medium. Each class will have two sections of 40 students each and each residential school will have a total strength of 240 students". For this, the school administration concerned should upload the details of students before May 28, 2016. Before the commencement of classes for the upcoming academic year, the teaching and non-teaching staff would be appointed on temporary and outsourcing basis. The selection process would be organised through a selection committee constituted by District Collector and Executive Director minorities though the district employment office and District Educational Officer sourced through an outsourcing agency before May last week.